As Penn State students, THON is something most of us are very familiar with. For the few that might not be, THON is a 46 hour dance marathon that students fundraise all year for until the big weekend in February where all the work over the year comes together and the total amount has been raised is revealed. Canning is a fundraising technique that raises millions of dollars for THON each year. Students will stay at a family’s home where they can have a home cooked meal and relax at night, then wake up early and stand in front of store fronts in fun Penn State gear and receive donations from people of the community. Canning is one of the most effective ways of fundraising and brings in a lot of donations for the cause. 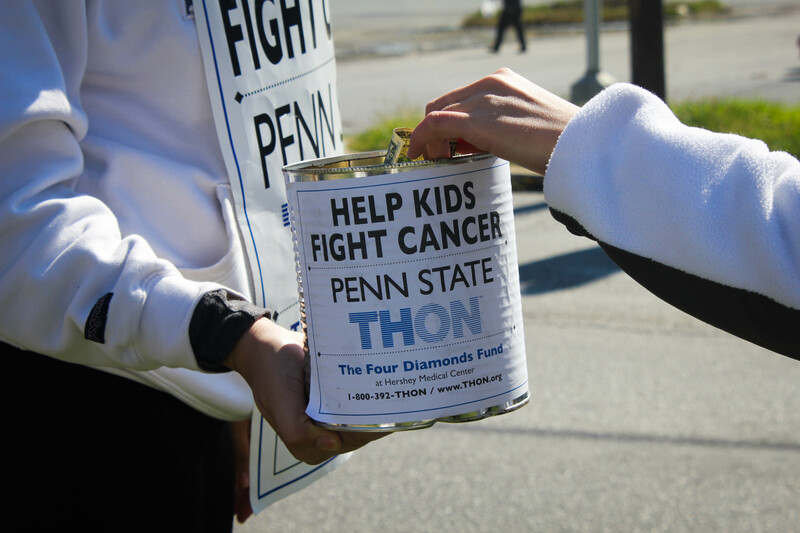 What sets canning apart from the other fundraising aspects of THON is that it is more personal. Sharing a link on facebook, setting up donation boxes, or sending out THONvelopes, are all useful and important ways of fundraising, but do not have the same effect has canning. A main part of why canning works so well is because there is some societal pressure. As a person in the community, you pull up to a bagel shop, a Target, a diner, or any other local business and are confronted with college students standing there with signs and cans. Olivia Mitchell writes here about Robert Cialdini’s six weapons of influence and talks about the power of being affected by the people around you. If someone is walking passed a bunch of students canning and he or she sees other passer-by’s donating, this increases the pressure and makes this person more inclined to donate. People are afraid of looking like bad person in front of their peers and will especially try to fit in to what is normal in society. The main reason I believe canning is more effective than other forms of fundraising is because you are able to make personal connections with people of the community and while not everything is about the money, this does make people want to donate more when they feel a more personal connection to the cause. Here is an article where Ian Altman talks about after talking to someone with a personal connection to ALS made him want to get more involved in the Ice Bucket Challenge. While canning, you have the opportunity to talk to many different people who have stories to share while you can share your similar experiences. We talk about THON weekend and what it meant to us while people in the community will often share stories that have a connection. For example, I went canning this weekend and had a man walk up to my group and show us a picture of a boy who was clearly ill. He explained that this boy was his son and that the picture was taken two years ago while he was undergoing chemotherapy. Unfortunately, this man lost his son in August and explained to us how important fundraising for this cause was. For us, it boosted morale to keep pushing on for a few more hours and then for those who heard the story it gave them a personal outlook on the situation that they might not have had before. The personal and face to face contact that comes with canning makes it an essential and effective of our fundraising techniques for THON. This entry was posted in Uncategorized on October 30, 2016 by Andie Lynn Sullivan. I agree that the face to face interaction is very important, but I also believe that name recognition is equally important when canning. On my last canning trip, we split our two days between two locations. The first day we were in Bethlehem, PA. The second day we made our way to Washington, D.C. and canned on the steps of the Lincoln Memorial. We ended up making a pretty equal amount of money most days despite interacting with thousands more people in D.C.. We noticed that in Bethlehem, being only 2 hours from State College, a lot of people recognized THON as a Penn State organization and were more willing to donate. In D.C., we had to do a lot more explaining of what THON actually is and did not get as many people identifying themselves as Penn State Alums. I think The more people recognize and know about THON, the more successful you can be while canning. I agree with your point that canning allows the canners to form a connection with the donors, and that societal pressure to donate plays a role in the effectiveness of canning. I canned recently as well, and I also noticed trends involving these theories. When I was standing in a desolate area, the few people who walked by may have felt less inclined to donate because of societal pressure, but many people donated probably because they knew they were our only source of income at that time. One morning I stood by a Dunkin Donuts drive-through where people in almost every car donated, most likely because they saw the people in front of them donate, and knew the people in the car behind them were watching them. This topic of canning’s effectiveness is important to discuss, considering Penn State’s decision to take away canning after one more canning weekend next year. However, canvassing, soliciting door to door to collect money, is an alternative to canning, which also offers the opportunity to form personal connections with the donors, although there are less interactions than when canning. Very interesting blog topic, but you don’t really have studies or anything to back up your claims. If you can find some, I would definitely reccomend adding them to your blog to get a good grade. As someone who transferred in this year and am new to THON, I loved going canning and will be sad to see it go next year (although I’m graduating so it shouldn’t affect me). I met a lot of new friends, which is important as a transfer student, and I made a lot of memories. On top of that it was all for a good cause. My parents find it to be a waste of a weekend when I should be studying, but I think there are things more important in life than your GPA , and canning for kids who need help is one of them. Great topic! I really enjoyed this post because just last week I myself took on the role of being a canner. I absolutely love the feeling of having a hand in raising money that will go directly to help a family that has a child with cancer. Due to the fact that this past weekend was my second canning weekend of the year, I consider myself pretty well-seasoned in the whole area of canning. From my personal experience, I have actually noticed a lot of reasons as to why people donate. For one, when I go canning, I put on the most outrageous outfit possible and show off my best dance moves (which really are not good at all). I have had many, many people donate to me because they simply love my enthusiasm. I feel as though people donate to THON because they admire the fact that so many people rally behind this great cause and do so with such passion and enthusiasm. Also, I believe people donate because our cause is so great. Millions upon millions of people have seen loved ones go through a battle with cancer, and it is already so hard to see. Imagining a child go through that or even seeing a child go through that is life changing, and I feel as though it certainly motivates people to donate. I love this post because I loved canning. I agree with your “what makes it so effective” bullet because I experienced people come up to me and tell me personal stories and why they were donating. I love how you wrote about this because it’s unique. However, I think you could’ve maybe compared canning to other fundraising tactics and strengthened your argument! Maybe even made a mock trial where an organization used all of the tactics and looked at which worked best. Good job overall!